An inexpensive, environmentally friendly alternative to a toxic coating currently used in Australian naval helicopters has been developed at Monash University in collaboration with CAST Cooperative Research Centre in Melbourne. 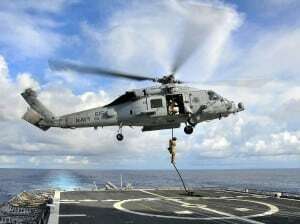 The magnesium alloy used to house the gearbox of Royal Australian Navy SeaHawk helicopters is prone to severe corrosion in marine environments, costing millions of dollars in maintenance every year. To protect the alloy from corrosion, it is covered with a chrome-based coating that is toxic to humans and the environment. The only way to find out whether the internal structures of an aircraft are corroded is to pull the plane apart and look. But new nanotechnology-based techniques being developed by Prof. Tanya Monro, Director of University of Adelaide’s Centre of Expertise in Photonics, in collaboration with the Defence Science and Technology Organisation, could make costly visual inspection in preventive aircraft maintenance a thing of the past.